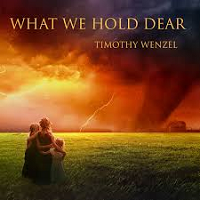 Timothy Wenzel’s What We Hold Dear is a high water mark for this prolific pianist/keyboard artist. He is once again joined by the immensely talented violinist Josie Quick who contributes on all but two of the twelve tracks. Also appearing on the album is cellist Jordan Schug, who is featured on six songs. As on his previous release, Distant Horseman, the album’s digipack is graced with evocative and gorgeous artwork, this time depicting a mother holding fast to her two children as a tornado ravages their farmhouse on what I assume to be the prairie of the American west. It is a highly evocative painting and makes quite the impact for those of us who have lived with tornadoes (living in Minnesota, I can attest to the fascination and, paradoxically, the horror of watching these wonders of nature). Wenzel has almost always excelled at two things on previous recordings. One, he has a real knack for composing gorgeous melodies, whether infusing them with drama and passion or subtlety and nuance. He is also a talented piano player when he uses that instrument in the lead. However, prior to his last album (2016’s Distant Horseman), which is the first one on which Quick guest appeared as a violinist, I found his string keyboard sounds to not be up to the challenge of equaling his appealing melodies, especially solo violin. His other keyboard sounds were usually at least adequate and sometimes exemplary. Another weakness I noted (and this is one that many artists, sadly, share) is his drum/rhythm programming, which also served to undercut the beauty of his melodies. I often wished he would allow the melody to establish the rhythm and not rely on snare or other drums to emphasize the power of a song. This is part of why I have not reviewed his previous efforts as I kept waiting for his strengths as a composer and performer to “emerge,” as it were, and not obscured by these weaknesses. Distant Horseman was a solid improvement, no doubt partly due to Josie Quick’s violin playing taking the place of sampled instruments. What We Hold Dear is another leap forward for Wenzel. His melodies are evocative and lovely yet never melodramatic or over the top. Given the powerful imagery of the album cover, that could have been an easy trap to fall into, but song after song, Wenzel shows a subtlety and nuance that is not just respectable but admirable. Both Quick and Schug match his keyboards perfectly on every track on which the two appear. Another thing I noticed was how so many of keyboard sounds have improved. The solo flute on “A Spring Day In Autumn” is especially lovely, as are his guitar sounds throughout the recording, most notably on the delightful “Appalachian Waters” which features a particular catchy refrain, as well as on the opening to “Hypnotized,” which marries a quiet somberness with new age undertones of magic and mystery. Quick’s violin on this track aptly demonstrates why she is becoming in demand for other artist’s albums (check out her work on Sensitive Chaos’ March of the Timeshifters). Sadly, this track also marks the emergence of the snare drum programming that I don’t think contributes but detracts from the track. Wenzel’s melodies’ rhythmic components are more than adequate to convey tempo, drama, etc. On a plus note, when the drums do appear on the remaining tracks, they are pushed deeper into the mix than on some previous releases, so there is that. But on such a pretty melody as “In A Little While” those rhythms really buzzkill the loveliness of the violin, flute and piano for my ears. Luckily, the album ends on a high note with the wistful “Turquoise Sky, Emerald Sea” which is basically a piano/violin duet with some rhythm guitar in the background. I realize I may be in the minority in my criticism of Timothy Wenzel’s drum programming, as I know his albums have received lots of praise-filled reviews. My perspective is that one of two things would improve his already impressive recordings: (1) Stop incorporating drum rhythms altogether and allow your strong melodic elements take that role or (2) hire someone else with a proven track record in that specific area to handle the insertion of the rhythms (or even get a live drummer to supply the beats). I feel strongly about this issue because Wenzel is a great composer and a talented pianist as well and I think these fixes would elevate him to a higher level. On the other hand, this is just my two cents and maybe everyone else thinks it’s a non-issue. Regardless, What We Hold Dear is a very strong recording and I enjoyed listening to it many times before writing this review. In the end, Timothy Wenzel’s strengths definitely outweigh my one critique.